Price lists are essential to any photographer. We have designed our templates to be trendy and handy. You can easily add your own prices or pictures. 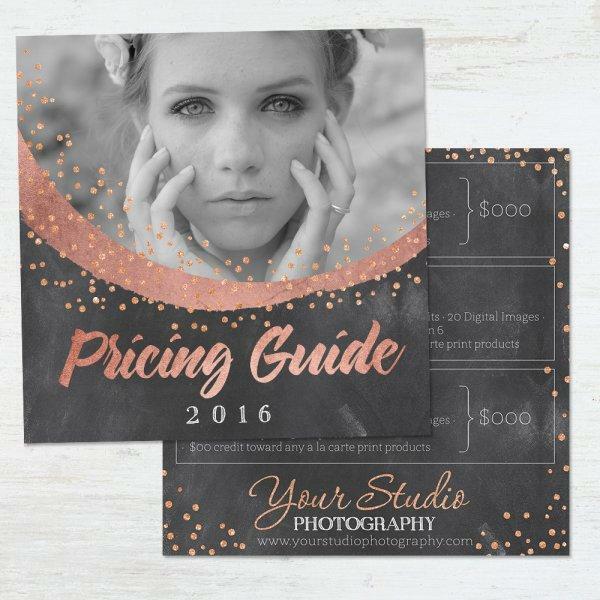 This Photography Price list has that golden touch which will surely impress your clients. Edit the text and add your own prices in a matter of minutes! When design comes first, so does our impulse to seek new trends. Go minimalistic with this amazing Photoshop template for creating a Price List. Unique, fresh style of a superb Senior-inspired Price List Template! When it comes to photography marketing, what people see has a very huge impact on their decision on whether to work with you or not. This coupled with the right pricing for your services will have a direct implication on the decision that people make thus assuring you of success or hindering the same. As such, it is always good to have your price list ready everywhere you go and these should not look shoddy but professional and aesthetic. 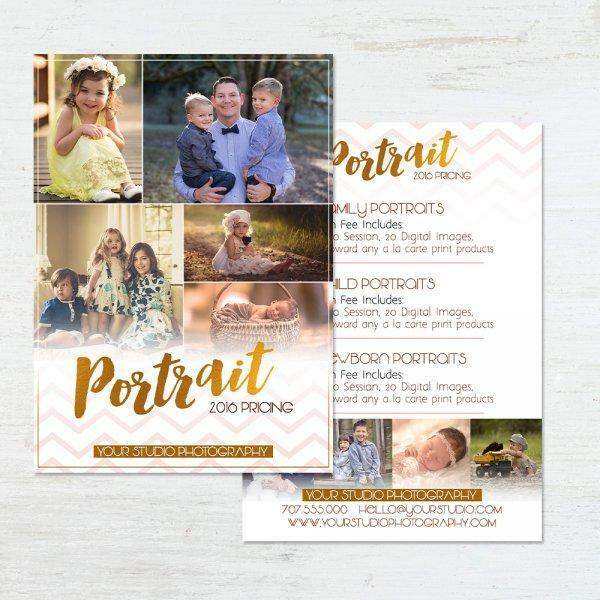 With these photography price list templates, you will be able to create impressive and sharable price lists which you can handover to anyone whenever the need arises. Sounds interesting, right? For many of us, thinking about budgets, calculating costs, bookkeeping tasks, etc. may seem a boring idea; however, it's a need if we plan to make the business profitable and in order to avoid bankruptcy by investing more money or accepting a greater debt margin than what our own budget allows. We won't go any longer in explaining economical factors as this isn't our area, but let's think of something that comes to the day to day life of every single businessperson: assigning a value to the job you do. How many times people may knock at your door, or even call you, to ask how much would you charge them for shooting that birthday party for their daughter because the grandma wants a picture with all her grandchildren on it. Or even formal celebrations such as an engagement party, a baptism and so on. Perhaps many times you may come across with the scenario of doing a rapid sum in order to give an estimated price to a potential customer at a social gathering - why not carry around a business card with your current fees for your job: those are Price Lists. How can Price Lists benefit my business? By carrying a complete list of your fees, you're likely to avoid giving a mistaken price if you happen to update your fees on a constant basis for making your way in such a competitive market. Moreover, an approach like this will only prove to show how much emphasis you put into your business and acts as a certain guarantee that your business isn't a phony offer, but a serious establishment, where your effort and dedication allowed you to be able to present an offer in first place. Imagine that you can show your clients a well-crafted price list, that does not only showcases your professionalism but also your personal style as well as the level of skills you put into your work. A scenario like that may come to reality in less than you thought by using Adobe Photoshop thanks to templates. Saves time: Explaining different services and their prices can be time consuming and tedious at the same time. As a professional photographer, you do not have to repeatedly explain what it is that you do and the much you charge for each particular service every time a potential client shows some interest. Instead, you can put everything down in an organized manner and hand it over to those interested whenever they need some information regarding your services and charges. Convenience: One of the greatest advantages associated with Adobe Photoshop photography price list templates is convenience. These templates are like a neatly organized check which you can write whatever you wish at any given time. This simply means that whenever there are changes in your pricing or you have discounted mini sessions, all you have to do is to change the wording and prices to suit your needs. 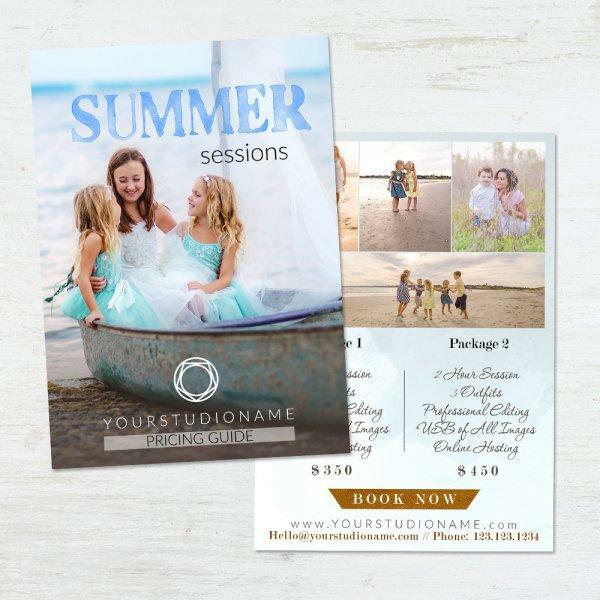 Photography price lists will always allow you to change the content in a matter of minutes and print with ease thus making your operations convenient and cost-effective. Lowers your operation costs: Imagine a scenario where you have to place an order for price list copies every time you need to market your services? The process is not only time consuming but also costs you a lot especially because you have to place a fresh order every time there are changes in your session charges or whenever you need to conduct mini sessions. 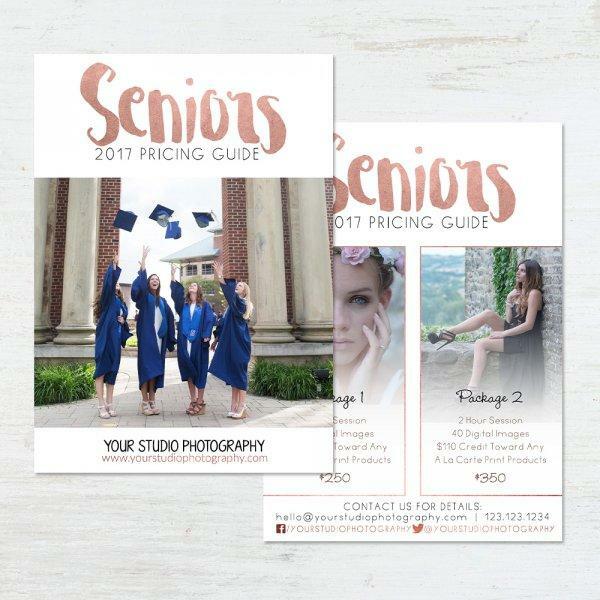 However, with photography price list templates, you will be in charge of your designing (a very simple process) and this means you don’t have to spend money of graphic designs or printing. Remember you can do the printing of your own price lists in your studio or wherever pro lab services are provided. Overall, you can save more than 60% when you use price list templates. Each of the available price list templates can be used as many times as possible without incurring any additional costs. Once you purchase and download the templates, they will be free to use within the allowed parameters. You do not need internet connection to customize your price lists and come up with what practically represents your business. 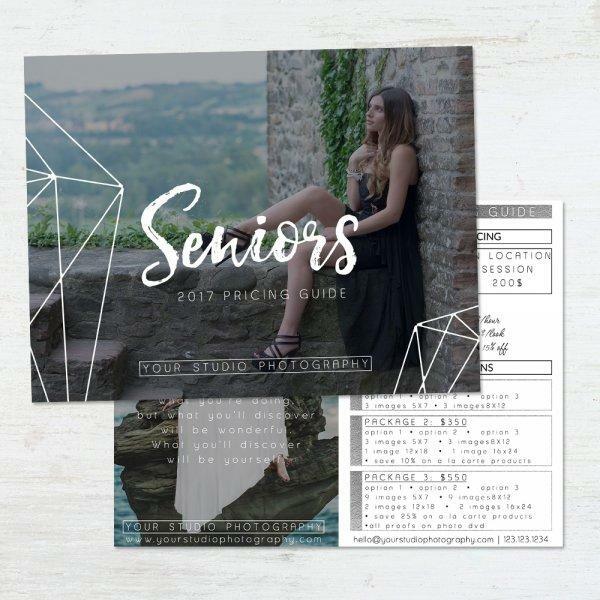 These templates are available in different colors and themes thus allowing you the opportunity to choose the one that best matches your needs. Do you want to know how to use these templates? Start by doing the culling process of the images you want to use. After that, open your chosen template into Adobe Photoshop; in there, you will notice that the first two layers are instructions, like pattern guides: The first one explains how bleeds for the printing process are going to be shown, whereas the second layer is an explanation of the Clipping Mask method for applying your desired images into these templates. Please remember to hide both instructions layers prior exporting your finished product. One of the advantages of working with the Clipping Mask method is that you're likely to perceive it as a neater method: there is no need to be cropping the image elsewhere; just resize it and apply the Clipping Mask option; as your image layer is going to be located above the template's own clipping mask layout, the image will be automatically cropped, keeping the ratio of margins, bleeds and frames used within the design's layout. In case you need any further guidance with the usage of this products you can take a look at our FAQ section at this website, or enjoy some video tutorials on our YouTube channel, that make the perfect combo for understanding how do these templates work without making a fuss about it. We're constantly thinking of new designs and models that may match your personal taste - a living proof of that is our ever growing selection of Lightroom presets and brushes, as well as Photoshop actions. Take a look below at these brief descriptions on how our Price List templates can make someone else's job an easier task. This template is best suited for creating a price guide which professionally displays the services provided for portrait sessions. 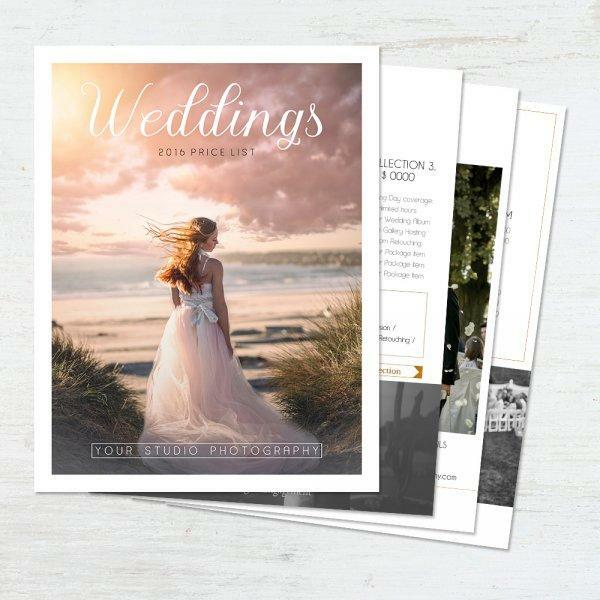 With completely editable text and the option to work with both the front and back of the 13x18 flat card, you will be able to create a professional looking price guide that matches your own business style. Best for displaying your fees for more intimate photography sessions, such as weddings, our “Minimalistic” price guide is made up of soft, simplistic, but elegant tones. With front and back editing options, as well as the ability to create text which best fits your needs, this template allows a wonderful way to display your prices. 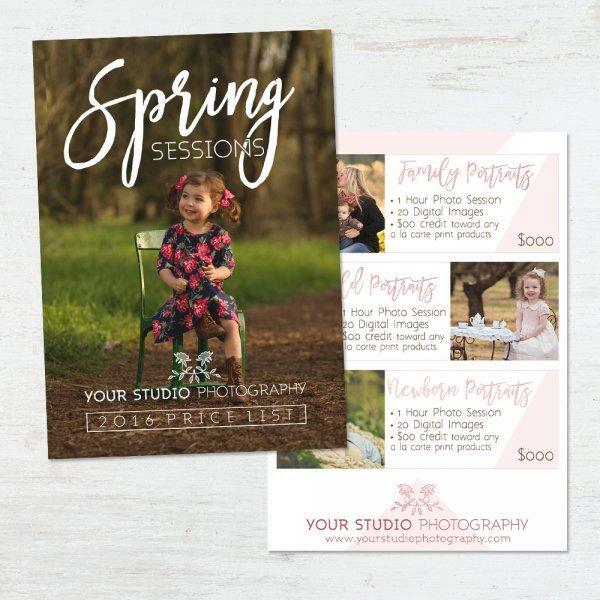 A wonderful choice for displaying your session fees for your other, more general offerings, such as spring photographs. 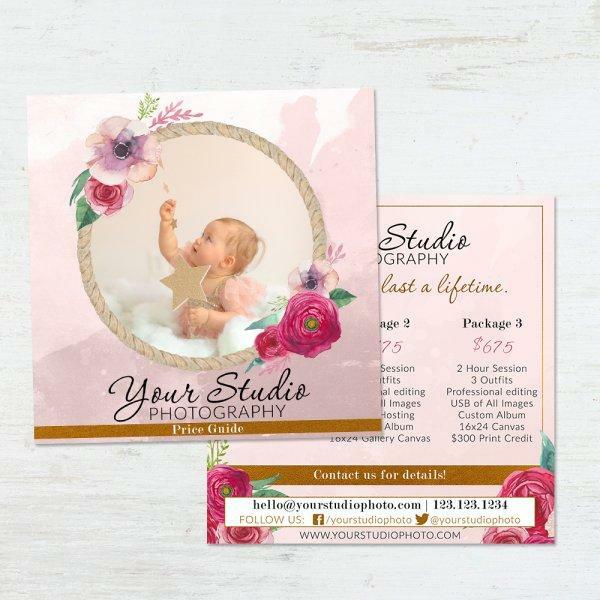 Like our others, this 13x18 flat card template contains adaptable effects, completely editable text as well as front and back editing options, making it great for showing the choices and costs of your more general photography services.